1) This is the @#%@$#%WTF is the Fed doing camp? In this belief camp, you are a buyer of consumer non-cyclical/non-discretionary stocks with 3%+ yields and hunker down. Think ATT, Pepsi and Utilities. They are going into the bunker as they are convinced the Fed has a death wish for the stock market after 10 years of mindlessly supporting stocks by making bonds and cash relatively worthless. That and the 3.7% unemployment rates (last time we hit that in 1969 we had a mild recession) and this camp sees the U.S. expansion peaking in early2019. This camp sees strong U.S. macroeconomic data (which clears the way for the now active Fed to continue raising short-term rates to cool-down the economy by "taking the punch bowl away") and the tighter-than-expected monetary trajectory hawkishness of rookie Fed Chairman Powell last week saying "We will undoubtedly take Fed rates above the neutral level regardless of the data" and the say "Yo--what happened to the "data dependent" Fed?" Data-dependent was a code word for "we learned our lesson from the Taper Tantrum in 2012 (the bond market crash in June 2012 when Bernanke said he was reversing Fed monetary policy and bondholders puked up bonds so hard he chickened out and reversed himself). Now add in global bonds hitting fresh milestones of misery--read $8 trillion of Italian Euro bonds and Emerging Market bonds denominated in appreciating dollars. Key point: Remember it's the velocity of the move in anything that is more jarring than the upward move itself (we live in a data algorithm world and when bond prices move two standard deviations lower in 5-trading days the algo/black box bells go off and dump first/think second). 2) The second camp is "The Inflation Genie is Out of the Bottle" camp. This camp believes the Fed is already behind the inflation curve and they are selling high growth/high PE stocks because the inflation they forecast makes their future after-inflation or "real" earnings worth less today. They believe we have a combo cocktail brew of killer inflation creating events: A) clearly rising oil and most commodity prices where Russia and Saudi Arabia can't replace the Iranian light sweet crude now cut-off by U.S. sanctions B) Upward trending wage inflation from companies desperate to staff (ditto--bonds go down in value when inflation assumptions go up because higher inflation expectations make bonds go down in value/higher in yield to keep their after-inflation real yield) C) transportation and tariffed input costs going up fast enough to push goods maker to raise prices (PPG today raised prices on all their auto manufacturing products 10% citing rising input costs like transportation and metals they are passing along to their customers. are conspiring to push Treasury yields to cycle-highs, hitting money managers of all stripes.) as well as a behind the curve Fed. Key Point: Bear Markets not caused by a financial bubble blowing up are caused by the Fed raising short-term rates too high in their effort to snuff out inflation. At the margins, big-ticket purchases are put off and debt payments eat up profit margins. Our 17.8 MacroMarket index says we are NOT at risk on recession in the next 4-6 months. The third camp is the smallest one: It's the buzz with my trading desk friends that all-out trade war is inevitable and China is flexing its muscles on our soon-to-be all-out trade war by selling big amounts of US treasuries to show Mr. Trump how trade wars really work. China's roughly $trillion US bond portfolio is mostly 10 and 30-year bonds. They are also devaluing their currency to offset more of the tariffs paid by US companies buying Chinese goods. The combo of a stronger dollar because of rising rates and China getting more RMB per dollar on exchange rates is a somewhat self-reinforcing phenomenon to offset 40-50% of the 10% tariffs if they got to 25% as this camp believes Let's not forget the Chinese stock markets are in a bear market (as well as the Emerging Market stocks and European markets--only Japan and the US of A stock markets are higher today than Jan 2, 2018. Key point: We have a $78 billion bond auction on Thursday. That will give a tell on rates. Net result? The value of the Bloomberg Barclays Multiverse Index, which captures investment-grade and high-yield securities around the world, slumped by $916 billion last week. Even for a $52 trillion market that is a LOT--and bond futures are down this evening as well. 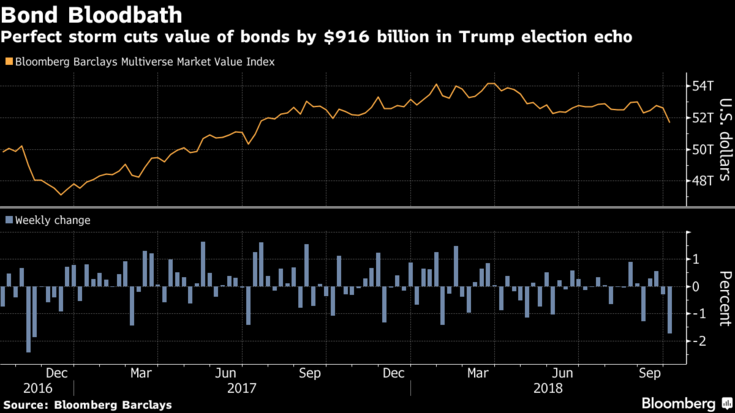 The market value of obligations with below-zero yields now stands at $5.79 trillion -- the smallest since January 2016, one year into large-scale European quantitative easing and two months before the ECB increased monthly purchases and expanded the program to include corporate bonds. The 10-year Treasury benchmark closed at 3.23 percent Friday, the highest since May 2011, while core European and Japanese bond prices have fallen as investors bet the era of ever-looser monetary policy is firmly over. Final Point: As I have shared since the Tax Cut--be careful what you wish for. Like I said back in December 2017: "Higher economic growth means higher rates of inflation and then higher nominal and real interest rates--there is NO free lunch." Action to Take: WAIT. It's not time to be a hero here. Our bountiful REALIZED profits (exceeding EVERY mutual fund and hedge fund so far in 2018) give us the luxury to sit back and watch this bond bloodbath and the destruction of Emerging Market and Chinese stocks. If this goes into full correction mode, it will be our favorite secular 15-20%+ growth sectors that will be hardest simply because they are up the most this year. The U.S. market and our favorite stocks have delivered amazing "Alpha" or outperformance from the overall stock market in every country on earth. We did get a turnaround today in the Dow 30 with the defensive, higher-yielding consumer non-discretionary stocks rallying in a "risk-off" trade to safety. Let's get through the Treasury Auction on Thursday and see if this rotation to safety is a blip or a trend. 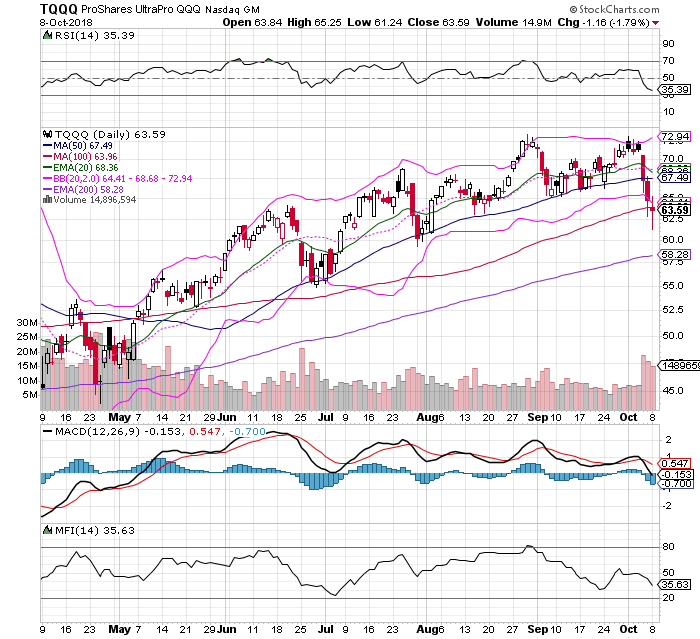 3.5% yield takes us down another 10% from the 132 top and key support is near 105-107. PS: O left out our 2X leveraged Business Development Company ETN BDCL in last update. Their loans are mostly variable rate secured loans so higher rates raise their portfolio yield. Their funding debt is usually fixed rate bonds so BDCs (Business Development Corporations) should be a beneficiary of higher corporate loan rates. Its 20% yield gives us a big margin of error here--we could be doubling down soon. We are under our $15.50 buy under price--but again let's not rush in and there could be a LOT of selling here in individual accounts. BDCL is WAY oversold--and so are bonds. It's been 40 years since 10-year Treasury Note dropped 10% of its value in 5 days--we should respect that price action. Finally--our TQQQ 2X leveraged ETN play is back at key support and VERY over sold. I'm raising Buy Under to $60 on a further wipeout. We got this trade at $55 last time--let's see where are end up this week. Stay tuned and watch for more Alerts as this turbulence will need yet another strong earnings showing to keep a floor to this market--big banks kick-off earnings season on Friday.